The European Championships is a major new multi-sport event taking place every four years with over 40 broadcasters covering the Championships across Europe and Worldwide. The 2018 edition took place in Berlin and Glasgow. France Télévisions relied on the Stage Racer 2 to cover this 10 days event, with more than 100 hours of live broadcasting. The decentralised networking capabilities of the Stage Racer 2 allow all locations to access the different feeds they required, thanks to the routing and distribution capabilities of the Stage Racer 2. – 1 was located in the editing room of the TV compound. Additionnally, a set of Stage Racer 1 was also used for the signals between the OB-Van and the TV set in the stadium. 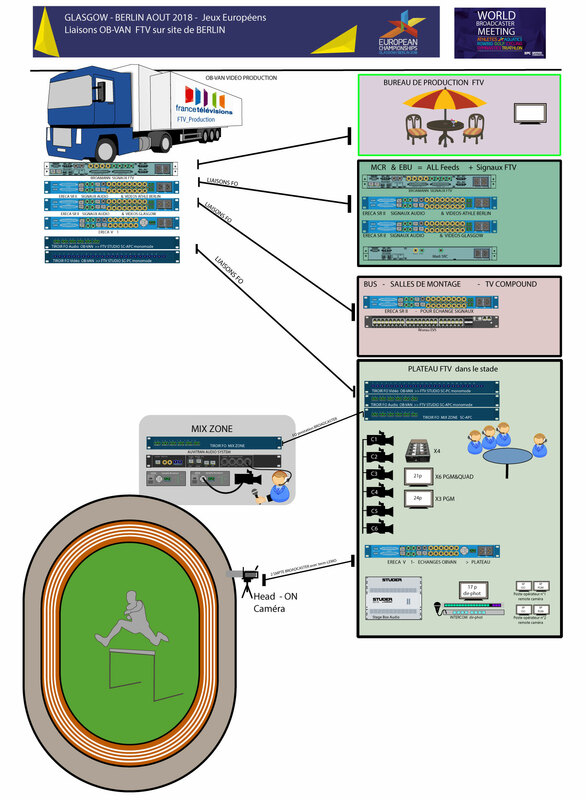 The following schematic provides an overview of the setup. For any technical questions, you can contact our French distributor Synoptic-Broadcast who provide since 10 years the technical assistance for the entire broadcast optical fiber facility of France Télévisions.